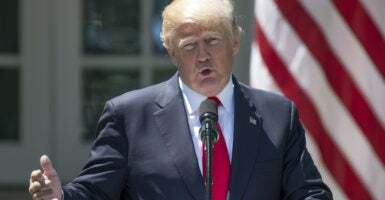 A coalition of 18 House Republicans nominated President Donald Trump for the Nobel Peace Prize Wednesday. “We, the undersigned members of the United States Congress, respectfully nominate President Donald J. Trump to receive the 2019 Nobel Peace Prize in recognition of his work to end the Korean War, denuclearize the Korean peninsula, and bring peace to the region,” the congressmen wrote the Norwegian Nobel Committee. GOP Rep. Luke Messer of Indiana was the congressman who sent the letter to the committee. The Indiana congressman was able to get 17 of his Republican colleagues to join in and support his nomination.